Hi lovely creatives! 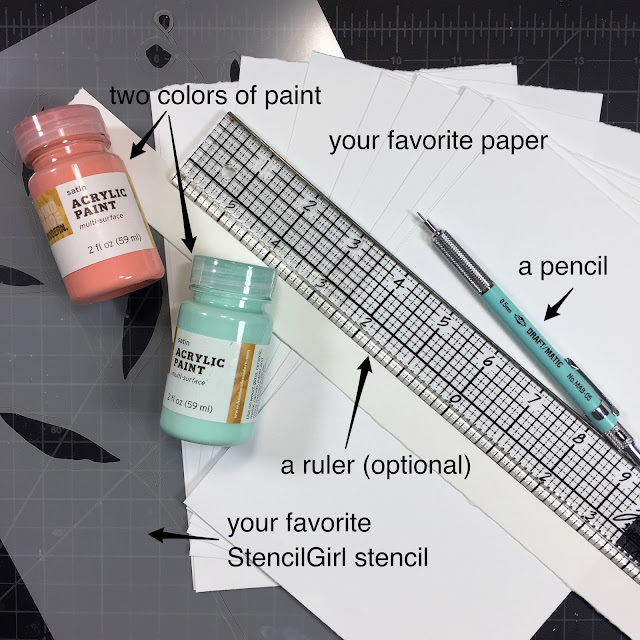 It's Kiala and I'm over the moon with joy as I share my first tutorial as a member of the StencilGirl Creative Team for 2017-2018. Today I'm sharing one of my favorite go-to stenciling projects. As a lover of paint, paper, fountain pens, and stencils, the perfect way to use all four is to create my own thematic stationery. And the best part is that it's super simple and a little bit addictive. To start, you'll want to grab a few supplies. For this set I'm using paints from Target, a mechanical pencil, medium weight mixed media paper, and the Sprout Friends stencil by Flora Bowley. I also use a craft foam brush not pictured here, but pictured below. Once you gather your supplies, the first step is to cut your paper to the size you'd like for sending handwritten notes. I tore my paper to 5 1/2 x 6. This size gives me lots of room for writing once my stencils have been applied. Step two is to add your paints. I like to pour mine out onto some kind of palette. Here, I'm using a styrofoam plate. You'll also want to decide how you will apply the paint through the stencil. 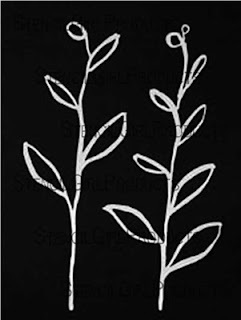 You could use a stenciling brush, a cosmetic wedge, or craft foam brush (my preferred method). Once you've selected and poured your colors, it's time to paint through the stencils. I start by placing my stencil on the left hand border of each of my sheets. I like to let the stencil run off the edge a bit to give my final product a little bit of character. I like to alternate colors and placement so that no two sheets look the same, but they all have a cohesive theme. If you find some of your stencil lines didn't show up, don't worry, we have a few more steps that will make you happy with the results. Grab a thin line black pen. I used my black fountain pen with permanent document ink. Begin creating sketchy lines to outline your stencil. For this one, I used loose sketchy lines that I inked over messily two or three times. I even did a few sheets where the black lines carried over into the stem of the flowers. Once you're happy with your sketchy lines, you can call it done or continue with embellishments like black or white dots, doodled lines, gel pens, silver or gold accents, or whatever your muse leads you to add. When you feel satisfied with your embellishments, it's time to write! I've been collecting fountain pens since I was 17, so anytime I can find a reason to write a handwritten note, I get excited to play with my pens. You might also make an extra set of 8 - 12 sheets, bundle them with a ribbon and give them as a gift to a friend. The ideas are limitless. There are so many to choose from. I can't wait to see what stencils you select for creating your own set of themed stationery. For added fun, you might stencil a few envelopes with the same designs as your sheets. I love the idea and the work that you've done. I'm a fountain pen person and I would fill every pocket I own with them! Karyl!!! I love meeting fellow fountain pen users. I've been collecting since I was 17, so my pockets are rather filled with them too :-). Thanks for the lovely note. Kiala, I'm so glad you chose this theme for your gorgeous artwork! I've long been fascinated with the way stencils can be used to border stationery, journals, picture frames ... I could go on. Thank you for sharing this with us, and thank you for including my Borders stencils in your list ... StencilGirl certainly has lots of border stencils, something for everyone! Cecilia!!! What a treat to see you pop in here. I'm honored. And I ADORE your stencils!!! Everything you do always takes a creative twist, Kiala! Lovely.